Paserene is the newest winery in the Franschhoek Wine Valley and is celebrates its first year with an Open Day, providing fun, food and entertainment for the whole family. The first Open Day is on Saturday 17th November and will be hosted in the Pasarene Tasting Room. Festival goers can expect live music from the acoustic band, Mack and Miller, Paserene and Shiner wines for tasting and on sale throughout the day, and loads of old-fasioned fun entertainment for children. There are huge lawns to relax on while you sip your wine, tractor rides through the vineyards, good food and all the fresh air you can handle! Also on sale will be special purchase offers and sought-after older vintages of Paserene wines. A food stand will be selling items hot off the coals to tempt diners of all ages. Vertical tastings of the award-winning Paserene wines with Martin Smith, winemaker and co-owner, will be offered at 13h00 and 15h00 on the day. Tasters can expect Paserene wines from the very first vintage, as well as the 5-star Platter Wine Guide Paserene Chardonnay 2015, and various vintages of both Paserene Marathon and Paserene Union. The tasting is limited to 12 people per session, so pre-purchasing is recommended. 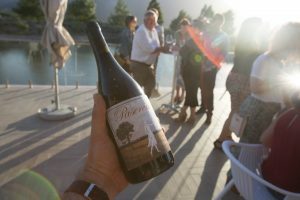 Paserene is a small family operated winery owned by Martin Smith and Ndabe Mareda with the sole purpose of producing highest-end luxury wines. Great care was given to ensure that the wines produced, and artwork on the labels, are truly authentic to ensure its “sense of place and people” and a lasting legacy for many years to come. The name Paserene comes from the Latin word Passeriformes, the order of “traveling and free” birds containing swifts and swallows. The opening of Paserene Wine Estate near Franschhoek. Monday 11th December 2017. Photos by Michael Walker.